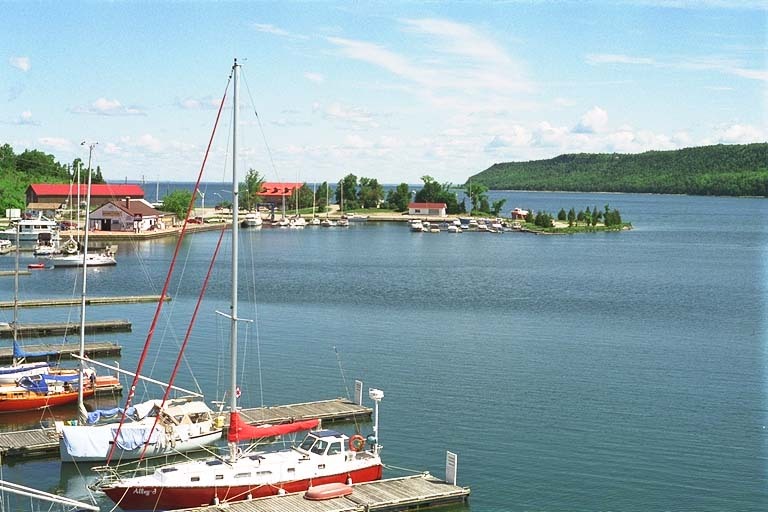 Gore Bay is the center of government on Manitoulin Island and also one of the most popular sailing destinations. After an absence of five years, we sailed down for an overnight stay in July of 1996. We found the bay, the marina, and the town just a delight. If you are on a North Channel Cruise, don't miss Gore Bay! Gore Bay begins east of Janet Head, where a deep and clear triangular bay cuts into the north shore of Manitoulin, leaving two tall bluffs on either side. At its southern end, it shoals into a perfect harbor; there the waters of Gore Bay end and the town of Gore Bay begins. 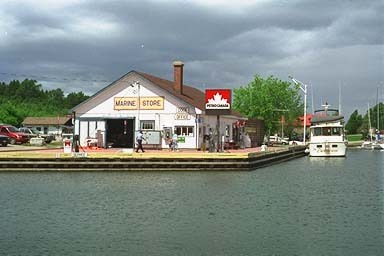 Gore Bay, the town, was incorporated in 1890, and it is now the second largest community on Manitoulin, having a permanent population of around 900 residents. It is one of the few communities on Manitoulin that does not have an Indian name. The source of that name is still debated. One theory is that both the bay and the town take their names from the steamer Gore. From Collingwood in southern Georgian Bay, the Gore called on the Manitoulin island area in the late 1800's. One winter it became trapped in the bay, and thus perhaps lent its name to the location and eventually to the town which was settled there. But another theory is that the inlet was already named "Gore Bay" because of its shape, and the steamer's similar name was coincidental. I personally like this theory, since the word "gore" means "a triangular piece of land", and the bay does form a perfect triangle. Municipal docks and a marina are tucked behind a small peninsula that provides strategic protection from the north, while the steep bluffs of the bay provide shelter from all other directions. The gas dock is the home of Canadian Yacht Charters (CYC), who also operate a ship's store there, one of the few in the North Channel. The town has made some nice additions to the waterfront over the past few years. 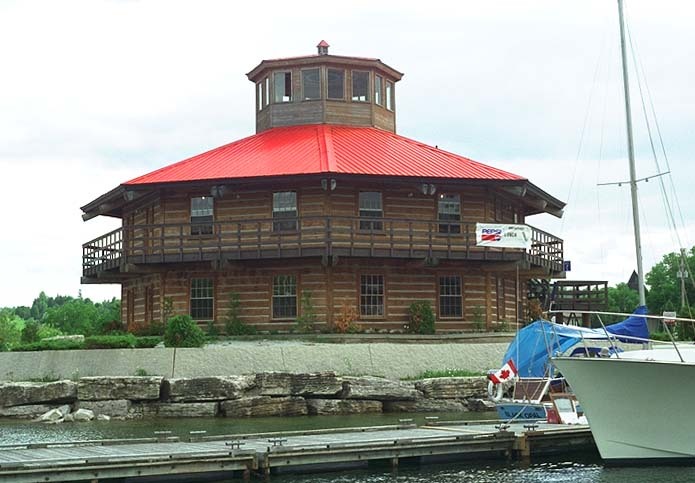 The red-roofed octagonal "Pavillion" south of the municipal docks, built in 1985, houses an information center. The second floor is now the "Tea Room" restaurant, which serves a nice breakfast buffet, as well as lunch and dinner. It's operated by the same people that run the Twin Bluffs Bar & Grill in town. Out on the northern peninsula, the town of Gore Bay has a warehouse/shopping center, housed in an old wooden log building. It is also home to the Gore Bay Fish and Game Club's Fish Hatchery. The southern end of the bay provides an excellent anchorage with good holding in firm sand. The water is rather deep, 15-20 feet, but shoals to 3-5 feet at the extreme southern end. On the eastern side of the bay is Gordon's Lodge. Gordon's has a nice dining room that serves the ubiquitous "Whitefish Dinner Special". We have rowed our dingy over to their dock and had dinner on occasion. The municipal docks have the best bathrooms and showers in the North Channel. The town itself has everything the boater needs: a bakery, a grocery, a hardware store, a marine store, a laudromat, and a boatyard, plus indispensables like a Brewer's Retail and a Liquor Store. There are tennis courts at the marina, and bike trails and bike rentals for the athletically inclinded. Also availalable in town are medical services like doctors, dentists, and a pharmacy. McQuarrie Chevrolet, Oldsmobile, Pontiac, Buick Inc. This article first appeared in 1995. Copyright © 1995, 1996, 1997, 1998, 1999 by James W. Hebert. All rights reserved.